Net4Society is the network of National Contact Points for the Societal Challenge 6 and for Socio-economic Sciences and Humanities (SSH) in the EU-Framework Programme Horizon 2020. 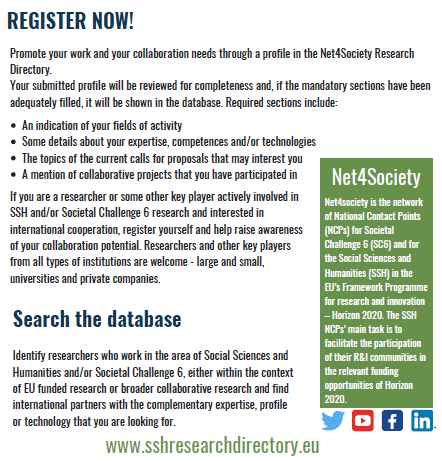 The Net4Society Research Directory is an English language online directory of actively involved RESEARCHERS and KEY PLAYERS in the Socio-economic Sciences and Humanities (SSH) and Societal Challenge 6. The Net4Society Research Directory is designed to facilitate research cooperation in the context of the EU Research Programme Horizon 2020. Add your profile in the Research Directory and you will be able to find and to be found! If you are a researcher or some other key player actively involved in SSH and/or Societal Challenge 6 research and interested in international cooperation, register yourself and help build a map of SSH research all over the world. Researchers and other key players from all types of institutions are welcome - large and small, universities and private companies. Identify researchers who work in the area of Socio-economic Sciences and Humanities and/or Societal Challenge 6, either within the context of EU funded research or broader collaborative research and find international partners with the complementary expertise, profile or technology that you are looking for.